Get Jobs in PAF by Join Pak Air Force 2019 as Education Instructor / Religious Teacher / Aero-Trades Online Registration is provided here on this page. 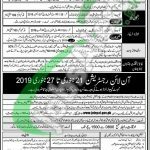 Jobs in PAF Pakistan Air Force are available and it is seeking for highly educated, very experienced, hardworking and well-disciplined candidates having valid CNIC and Domicile of any province if Pakistan against the following positions such as (Education Instructor, Religious Teacher, Aero Trades). Candidates willing to apply for Education Instructor should possess BA/B.Sc degree in the relevant subject to apply, for Religious Teacher post Intermediate and a diploma in Islamic studies from any registered Islamic Center and for Aero-Trades Matric (Science) in 60% percent marks is required to apply. Candidates from all over Pakistan can apply, but they are advised to compare themselves with the eligibilities mentioned in the following image. So, it is a golden opportunity for you to have a job in Pakistan Army and there are not too many requirements are available for the vacant jobs, so you can easily get a job in Pakistan Army. For interested candidates, we have provided complete how to apply procedure in the following heading. Note: - Those who wanted to apply for Education Instructor in (English, Maths and Physics) should hold Masters/Bachelors degree in relevant subject. Note: - Those who wanted to apply for Religious Teacher should be at least Intermediate pass and have a certificate of Islamic Studies from any registered Islamic Center. Preference shall be given to Hafiz-e-Quran individuals. Note: - Those who wanted to apply for Aero Trades should be at least Matric pass in Science Subject with 60% Marks. Height for all positions should be minimum 163 cm, age should be between 15 1/2 to 28 years and only Male Pakistani Nationals can apply. Candidates willing to apply should apply via online at the official site of Join PAF or through web link given below. Candidates don’t have access to the internet are suggested to appear at nearest PAF recruitment and selection center which is available in every major city of Pakistan. Registration is open from January 21 to January 27, 2019. Candidates have to follow recruitment procedure which is mentioned in the following image posted below. Candidates should bring original documents at the time of interview. Stay in touch with us and keep visiting our site JobsAlert.pk. Above we discuss Join Pak Air Force 2019 as Education Instructor / Religious Teacher Online Registration and for these newly announced opportunities only Male Pakistani Individuals possessing Masters/Bachelors/Intermediate qualification are welcome to apply before 27th January 2019. Registration Date: January 21 to January 27, 2019.